A test boat equipped with Volvo Penta’s D13-IPS900 propulsion package for IMO Tier III will be available for sea trials at Seawork. A test boat fitted with a Volvo Penta D13-IPS900 (700 hp) package and selective catalytic reduction (SCR) exhaust aftertreatment system will be available for sea trials by customers at Seawork commercial marine and workboat exhibition and conference, in Southampton, UK. The engine and latest IPS propulsion model – which runs at 700 hp but gives enhanced performance to the equivalent of a 900 hp inboard shaft installation– are complemented by a compact and flexible SCR. “We are offering a unique opportunity for customers to see the advancements we have made in propulsion technology and the reduction of emissions,” says Gerard Törneman, sales project manager for Volvo Penta’s Marine Commercial segment. While International Maritime Organization (IMO) Tier III standards are due to come into force in 2021 for the Baltic and North sea, Volvo Penta is giving customers the chance to fulfil their obligations more than two years early, as the company’s engine solutions become available in 2018. The solutions are optimized for marine applications, and will be available for inboard engines, IPS, auxiliary engines and complete marine gensets. Volvo Penta IPS is a unique, type-approved system that improves productivity and performance with exceptional maneuverability, thanks to the individually steerable pods that feature forward-facing, twin counter-rotating propellers that lie under the hull. The design also results in a reduction of fuel consumption and carbon dioxide emissions by 30 per cent – compared to inboard shaft engines – and an increase in onboard comfort due to reduced noise and vibration. “Volvo Penta is the first company in the market to deliver a complete and integrated propulsion system, from prop to helm, now including an SCR exhaust aftertreatment system – all from one supplier, for IMO Tier III,” says Thomas Lantz, product planning manager for Volvo Penta’s Marine Commercial segment. Volvo Penta’s D13-IPS900 is fitted with selective catalytic reduction (SCR) for IMO Tier III regulations. 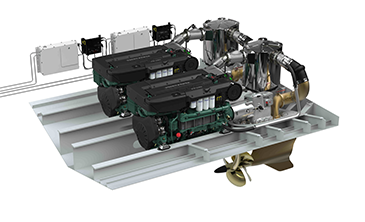 Volvo Penta’s D13 units for IMO Tier III are available to order now for delivery during Q4 2018. Volvo Penta will be at Seawork, UK, from July 3-5, at berth VA52 and stand PO93. To learn more about Volvo Penta’s IMO Tier III solutions, go to volvopenta.com.